This is a proud moment. The moment in which I announce the conquering of one of my biggest literary-related fears. The finishing of a full-length Charles Dickens novel. Of course, I've read A Christmas Carol over and over---but that doesn't really count. It doesn't count because, for one thing, it's a novella. Secondly, everyone, everyone, knows the story. It's easy to read A Christmas Carol because you can fill in the hard stuff with visions of Mickey Mouse and Jiminy Cricket, if you really need to. But Hard Times! Oh, the joy! (...and, Oh! The oxymoron!) It was just the right level of difficult for me. My knowledge of vocabulary was challenged, but I understood it all in context enough to laugh, smile, sigh, and nod my way through the whole wonderful book. I don't know why I've been so afraid to tackle 19th century classics. Every time I read one, I thoroughly enjoy it and come away feeling fulfilled and that I've spent my reading time wisely. 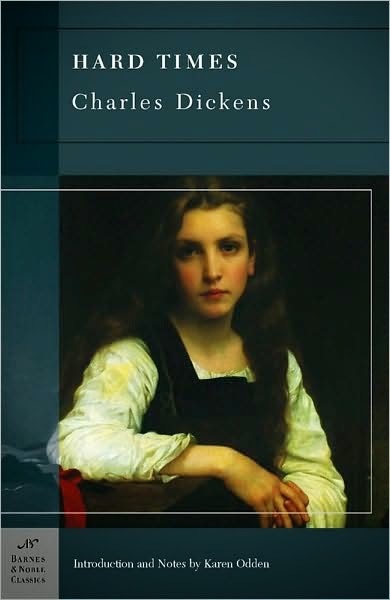 Book Description: "Set amid smokestacks and factories, Charles Dickens's Hard Times is a blistering portrait of Victorian England as it struggles with the massive economic turmoil brought on by the Industrial Revolution. Championing the mind-numbing materialism of the period is Thomas Gradgrind, one of Dickens's most vivid characters. He opens the novel by arguing that boys and girls should be taught 'nothing but Facts. Facts alone are wanted in life.' Forbidding the development of imagination, Gradgrind is ultimately forced to confront the results of his philosophy--his own daughter's terrible unhappiness. Full of suspense, humor, and tenderness, Hard Times is a brilliant defense of art in an age of mechanism." My Thoughts: There is so much to enjoy about this book that I do find it difficult to really put it all into an orderly review. I was surprised by the many elements of mystery, romance--even a bit of edge-of-your-seat action at the end! I do wish some of the characters would have ended up with happier endings. I found that many of Grandgrind's "facts" were truths of his own making and it caused me to reconsider some of the things in my own life that I would consider "facts". I also chuckled, a lot, at the revelation of Bounderby's "origins". The "unwanted wife" trope, reminiscent of both Jane Eyre and Silas Marner, was interesting to see. I like to think that Dickens was riffing off Bronte's work of seven years earlier and that Eliot, in turn, was inspired to include the theme in her work, seven years later. I liked the idea that both Sissy and Stephen's wife were making big impacts on the characters without actually being present in the story. Stephen's wife, especially, was a major player---yet her time in the novel takes up but a few sentences. If it weren't for her though, many of the characters' lives would have taken entirely different directions. "If he had only learnt a little less, how infinitely better he might have taught much more!" Also, Dickens's fun play on Peter Piper: "If the greedy little Gradgrinds grasped at more than this, what was it for good gracious goodness' sake, that the greedy little Gradgrinds grasped at?" Hard Times will be included in my goals toward the Full House Challenge: "Book by an Author You Really Like". 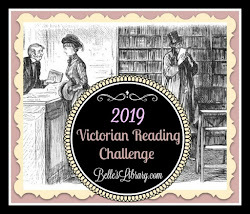 For more information on the challenges I've joined this year, see my post, Reading Challenges.